A temporary greenhouse is typically one constructed during your winter months for protection of tender plants, with little to no ground preparation being needed. Some units may have a steel frame or a pole frame, but the covering is usually some type of film. These may be built and taken down in a reasonable amount of time. There are even some low-end pop up models. They typically have no snow loads or wind loads. In fact, most manufacturers recommend that the covers be removed prior to high wind conditions. These structures usually have a short warranty of no more than one year. The best thing about these temporary greenhouses is they are very affordable, with many models costing less than $1,000 and some even under $100.00. But there is a reason they have such low prices – this type of greenhouse is not designed to be functional in harsh weather (or even mildly bad weather) and many times have a very short life span. They have a purpose but the buyer also needs to remember that you almost always get what you pay for. A permanent greenhouse is much different. 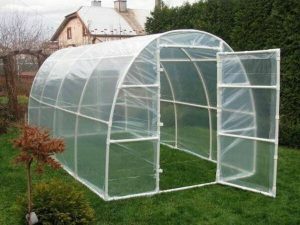 They generally have a higher quality frame that is bolted together, although some of the better quality temporary greenhouses also have this. Permanent structures usually glazed with a more rigid material like polycarbonate or glass. Good quality permanent greenhouses are rated for snow load and wind load and some may require a building permit before they can be installed. Their prices vary, but most of them cost at least $1,000 and sometimes much more. They will either require a foundation or an optional base which can be purchased from the manufacturer. It is important to prepare the ground before installing a permanent greenhouse and many times it makes sense to have a professional complete the installation. 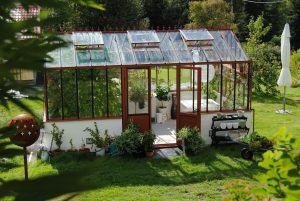 The warranties vary with permanent greenhouses ranging from one year to limited lifetime warranties. Temporary greenhouses are relatively easy to transport and some of the smaller permanent greenhouses can be placed on a trailer and moved without disassembling. It is not a good idea to move even a small permanent greenhouse more than a short distance without disassembling it. If a greenhouse is going to be moved more than a short distance it needs to be disassembled before the move is made. This is a tedious procedure; each piece should be marked so it can be easily reassembled. Disassembling and moving a greenhouse more than once is not recommended as you may start to have problems with worn out glazing tapes and screws. Some of these structures even have the panels held in place with silicone and removing the caulking from these is a difficult and very tedious process. Tammy Wylie has been selling and installing greenhouses since 1993. She currently owns and operates two greenhouses, an 8 x 12 is used to overwinter plants and an 18 x 24 greenhouse is used to start vegetables, herbs and annual flowers. She also tests new products in this greenhouse and evaluates them for efficiency and user friendliness. She is the owner of Advance Greenhouses AdvanceGreenhouses.com.